Our group is growing and it’s heartening to see more parents placing sleep as priority for the entire family! A month ago, my 6MO incurred quite a bit of sleep debt due to missed naps, over-tiredness, and occasional later bedtimes (730PM). I noticed he was waking up often in the night and especially between the hours of 4AM to 5AM. As a result, he was not well rested and had to catch up on his sleep in the day. His morning wake time was extremely short and he was basically using the morning as an extension of his night sleep. This disrupted his circadian rhythm quite a bit and during times where he should be energetic and active, he was listless and tired (yawned quite often). NOTE: Wake time for a 6MO is approximately 2 hours (can be 1.5h in the morning to max 2.5h before bedtime). I read books by Weissbluth, Ferber, and several online blogs by experienced mommies. Initially I took Ferber's advice by limiting his sleep hours and pushing bedtime later, boy this was a HUGE DISASTER. I recalled what my sleep consultant mentioned, "Sleep begets sleep" and this was also mentioned by Weissbluth and several other sleep experts. I plucked up the courage to push his bedtime early (sleep by 5.30PM), once even as early as 4.30PM, and over a period of one and a half weeks, he managed to recover his sleep debt. On days where naps are terrible (less than the desired amount) or missed, a 5.30PM bedtime is recommended or depending on your family's schedule, as early as 1h to 1.5h before typical bedtime. Many parents think that a later bedtime is better for their babies as it pushes their wake up time. NOT TRUE (unless your baby naps MUCH MORE than the desired amount in the day)! Babies' bedtime should come in approximately between 12 to 13 hours after their morning awake timing. For example, a 6MO wakes at 8AM. She should be asleep by 9PM to have at least 11 hours of sleep. An earlier bedtime does not mean that babies will wake up earlier. In fact, an earlier bedtime allows their cortisol (stress hormone) levels to drop further such that between 4AM-5AM, the cortisol:melatonin ratio will be lowered to extend sleep (easier to fall back to sleep despite being in the light sleep zone) in contrast to having a situation where your baby finds it hard to get back to sleep and is up crying. It's like us adults, waking up at the wrong time and taking forever to enter snooze land. Babies are more sensitive (and impatient) than us hence they will cry out more during prolonged and frustrated night awakenings. Somewhere between 3 to 5 months (varies from baby to baby), your baby wakes up more frequently in the night and undergoes a change in napping pattern (short naps of between 20-45 minutes). You may convince yourself that this is temporary, or like me thinking that it is a growth spurt period. In reality, this change is permanent. This change in sleeping pattern is part of their neurological (brain) development to sleep like adults eventually. As long as your baby is unable to sleep independently, he will wake up at the end of almost every sleep cycle. This could well be every 1 to 2 hour in the night. Both your baby and you are now sleep deprived. 2. 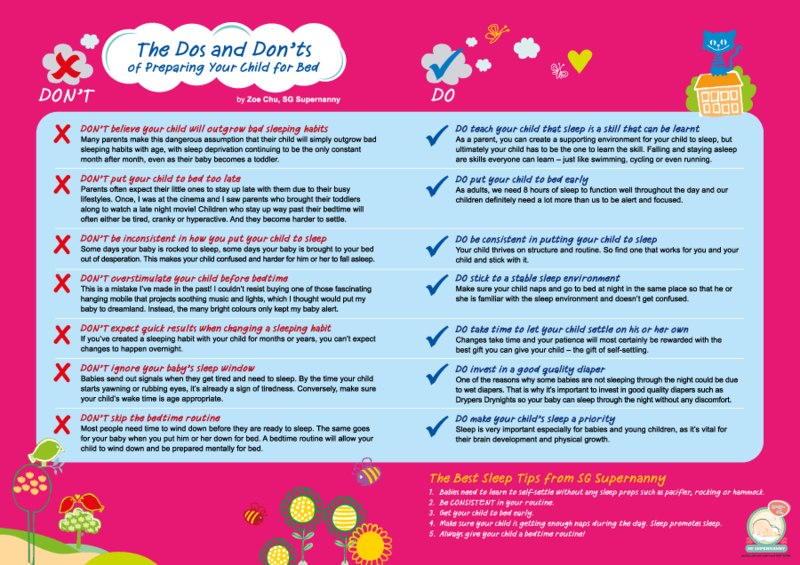 Your baby does not go into deep sleep immediately. 3. Your baby cycles between deep and light sleep. 4. If you nurse/rock/carry/pat your baby to sleep, he will expect the same thing when he wakes up. Breastfed babies may not want to nurse when he wakes up and if you don't have another sleeping tool with you, you are left with a crying baby who is desperate to get back to sleep. Sleep props and sleep association are acceptable when our babies are young (between 0 to approximately 3 months old) but in view of the change in their sleep cycle, it is advisable to wean them gradually as they approach 4 months old. My boy's two to three awakenings in the night seem to follow this chart. Source: Ferber R. (2006) Solve Your Child's Sleep Problems. Revised edition: New, revised, and expanded. Fireside. One of the greatest myths about sleep is: When babies sleep lesser in the day, they sleep longer/better in the night. On the contrary, a well-rested baby is able to sleep much better in the night. Sleep begets sleep. The sleep trainer that my husband and I engaged, Ms Zoe Chu of SGSupernanny, shared with us on the myths surrounding sleep. French people practice the "Pause" - giving babies some time (5 to 10 minutes) to settle themselves before you intervene. Their babies are also able to sleep through the night from 4 months onwards (which is considerably 'rare' in Singapore). The book 'Bringing up Bebe' was recommended by my sleep trainer. This blog has a good summary of the book. My 21 weeks old boy sleeps between 1.5-3h for each nap. His bedtime is between 6PM to 7PM, given a final feed at 11PM, and sleeps till 6AM-7AM. Sleeping through the night is a misnomer as babies do wake up a few times and experience partial or even full arousal (cold, wet/soiled diaper, nightmare, sleep talking, teething, physical milestones development e.g. flipping, crawling, standing, walking). If your baby knows how to sleep independently, he is able to put himself back to sleep without your assistance. A suitable bed time for babies and toddlers is between 7PM to 8PM. In the Singapore context, childcare starts at 7AM. If your child sleeps between 9PM to 12MN, he has only 7 to 9 hours of sleep which is likely to be insufficient for him to last the day. 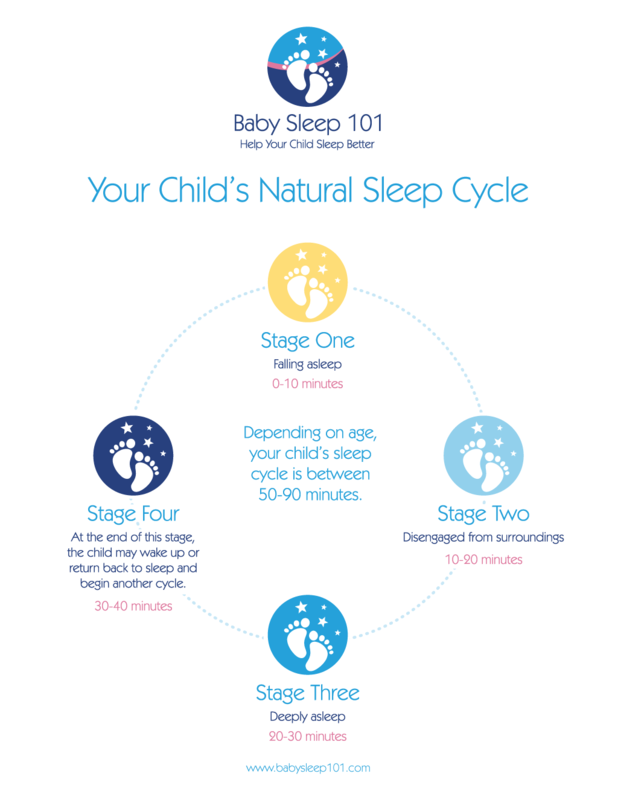 This chart is useful to understand how babies progress in their sleep pattern.